How good is it for farmers, consumers? THE government has raised the minimum support prices for pulses by up to Rs 700. It is a 15-30 per cent increase over the previous year. The government also promised an incentive of Rs 5 per kg if farmers sell black gram, green gram and pigeon pea to procurement agencies within two months of the harvest. Farmer unions have welcomed the decision announced on June 10. The minimum support price, or MSP, announced every year at the beginning of the crop season, guarantees farmers a remunerative price. This enables them to step up production. “Pulse cultivation remains confined to rainfed areas because of low MSP, which means low earning for farmers,” said Ajay Jakhar of Bharat Krishak Samaj, a farmer union in Delhi. The government never promoted pulses the way it did wheat, rice and other cash crops. A 30 per cent hike in the MSP would increase the area under pulse cultivation and boost production, Jakhar said. “If the trend continues, it would encourage farmers to use fertilizers and advanced technologies to increase the pulse yield,” he added. This would help reduce pulse imports. In 2009-10, India imported 3.5 million tonnes of pulses. The hiked MSPs aim at two things: increase in crop production and, as a result, a decline in food prices, said R S Sidhu, dean of the College of Basic Sciences and Humanities, Punjab Agricultural University. Consumers are facing double-digit food price inflation; it was 16.12 per cent in the first week of June. Sidhu doubts the advantage would percolate to the consumer. “Traders earn double the amount they pay to the pulse farmers. They blame the increased MSPs and jack up pulse prices in wholesale and retail markets, forcing the consumer to pay more,” Sidhu added. The government must keep a tab on market prices, he stressed. Rajesh Gupta of the Delhi Grain Merchant Association, however, said the price offered to the consumer includes the price paid to the farmer and processing and transportation costs. 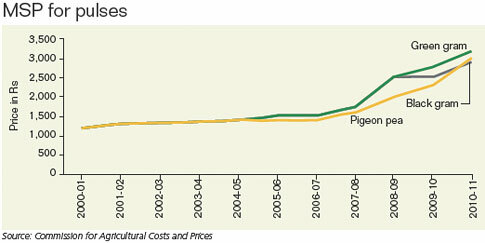 “So if farmers are paid more, the market price of the commodity would go up,” he added. But high prices cannot be pinned to one factor. Insufficient production, hoarding and growing imports are responsible for the spike in pulse prices in the past few months, Gupta added.